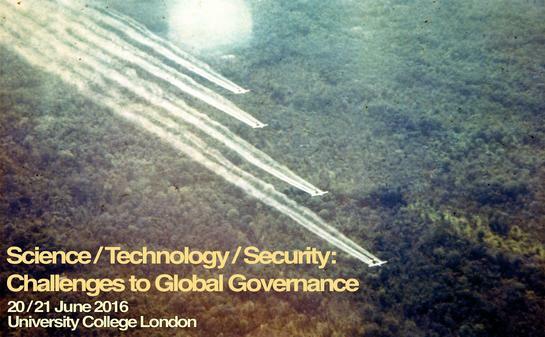 Call for Papers Science/Technology/Security: Challenges to global governance? The GGI is hosting a two-day international conference on the interdisciplinary theme of science, technology and security on 20-21 June 2016. We live, interact and research in a world rife with the demands, rhetoric, technologies and policies of security. Recent work across the social sciences and humanities has not only attempted to identify and describe the networks, norms, agendas, spaces and actors that constitute environments of security, but has also identified how manifold notions of security co-exist, compete and shift over time and from place to place. Scholars have studied experiences of living and feeling as notions of technologies of terrorism have changed; others have examined how ideas about the human body shape and are shaped by technologies of war, detection and prevention, such as drones. Still others have focused on the many issues associated with arms control and regulation, non-proliferation and secrecy - whether epistemological, political or sociological. The roles that science and technology adopt in the realm of security present extensive areas for study: how, when and by whom is science used to justify, legitimise and procure security policies? Who negotiates what science is when it comes to security issues, when such knowledge is classified or secret? How are science and technology used to create 'solutions' to security problems, and how and when do they lead to security problems themselves? How are ethical concerns balanced with national security, and what constitutes legitimate regulation of norms? Are norms changing? Our conference will be an opportunity to create a dialogue around these questions and, more importantly, to shine light on emerging issues in the field. Jeanne Guillemin's training in medical sociology and anthropology at Harvard and Brandeis Universities has led to her involvement in issues regarding unusual infectious diseases (including anthrax, SARS, the Ebola virus, and MERS) and biological and chemical weapons. She is the author of Anthrax: The Investigation of a Deadly Outbreak (University of California Press, 1999), which documents her epidemiological inquiry into the controversial 1979 Sverdlovsk anthrax outbreak in the USSR. With a MacArthur Foundation writing award, she next wrote Biological Weapons: The History of State-sponsored Programs and Contemporary Bioterrorism (Columbia University Press, 2005) a valued course text. Her 2011 book, American Anthrax: Fear, Crime, and the Investigation of the Nation's Deadliest Bioterrorist Attack (Macmillan/Henry Holt, 2011), offers a thorough account of the 2001 letter attacks that changed national policy regarding bioterrorism. She will be speaking on her current research; a new book that explains why Imperial Japan's use of biological weapons during World War II failed to be prosecuted at the Tokyo war crimes trial, 1946-1948. In addition to consulting and lecturing, she was a member of the World Economic Forum's Global Agenda Council on WMD (2009-2013), serves on the board of Transaction Books, and is an associate of the Harvard-Sussex Program on chemical and biological weapons disarmament. Brian Rappert's wider research involves the social and ethical dilemmas associated with scientific and technical expertise. His book Biotechnology, Security and the Search for Limits (Palgrave Macmillan, 2007) examined how the responsible stewardship of the life sciences can be ensured so as to avoid civilian research being used to intentionally spread disease. In 2005 and 2007 he received grants from the Alfred P Sloan Foundation to conduct seminars for practicing bioscientists in over 10 countries regarding the dual use implications of their research and appropriateness of related policy responses. He is active in examining and participating in attempts to enhance the humanitarian restrictions governing the conduct of war. His other books include Controlling the Weapons of War (Routledge, 2006) and Non-Lethal Weapons as Legitimizing Forces? (Frank Cass, 2003). Brian's research takes place in the security and diplomatic communities, where questions of disclosure and concealment loom large. He will speak on his current research project, which reflects on the methodological issues associated with investigating and writing about secrecy. Funded by the Economic and Social Research Council (ESRC), the Defence Science and Technology Laboratory (Dstl) and the Arts and Humanities Research Council (AHRC), the project began in 2013 and has resulted in a recent book co-edited with UCL's Brian Balmer, Absence in Science, Security and Policy: From research agendas to global strategy (Palgrave Macmillan, 2015). We welcome contributions from sociologists, geographers, engineers, STS scholars, anthropologists, historians, IR scholars, security scientists, and other relevant fields. Submissions should consist of a paper abstract of no more than 200 words and a short bio. These should be submitted to scitechsec16@ucl.ac.uk by 31 December 2015. To be kept updated on conference information, follow the Global Governance Institute on Twitter (@GGIUCL). Details on registration to come. Specific questions should be addressed to Jason Dittmer (j.dittmer@ucl.ac.uk) or Alex Mankoo (a.mankoo@ucl.ac.uk).